A Year on an Island Made me Grow. There is a huge list of things that go through your mind when you have a dream of traveling and moving somewhere entirely new. It’s scary, frightening, freeing and exciting all at the same time. My wife and I had a dream to move to Hawai’i on a one-way ticket, but we didn’t know when that would be since I was chasing my first dream of becoming a running back in the NFL. After my latest NFL Regional Combine in March of 2014, I didn’t receive any rookie camp invites or tryouts, we decided it was time to make the leap and go on an adventure. Moving on isn’t the same as giving up. When we announced it to our friends and family, we were met with both friction and support, concern and encouragement, worries and applause. When all was said and done we ended up living the aloha lifestyle for about 14 months on the island of Oahu, Hawai’i. It was one of the best years of my life. My wife and I kicked off the New Year with my Brother, his wife Stephanie, and my Dad visiting us in Hawai’i. It was the end of two weeks that we really cherished. Being away from home, family, friends, and everything you’re familiar with is difficult, but very rewarding. In 2015, I felt alive and started to really live intentionally. I came to peace with putting my first dream and passion aside. Being away from friends and family and the daily routine I was accustomed to, I had the opportunity to take a look at my personal life without any bias. I was working remotely for CCI Systems as a Senior Product Designer when we moved and decided to work CST hours. This meant getting up at 3am during the week which was intimidating at first but after the first week of doing it, I loved it. It made me view time and how I spent it entirely differently. I woke up in the morning and had time to spend to myself, to mediate, reflect on yesterday, make goals for Today, and get a real jump on the day. In almost any job, on any given day, things come up that you have to take care of and take you away from your originally planned events. My days usually consisted of working from 4am-Noon and then Lauren and I would go to the beach, go for a hike, or go out to lunch or an afternoon movie. One of the biggest things I enjoyed about Hawai’i was really getting to spend more time with my wife. Life gets busy and there’s always something going on, but in Hawai’i we were able to make our own plans and spend lots of time with just us two. Last year, I really grew to enjoy reading. It’s like being mentored by the author and you’re given real insight into their life, the way they think, and what they place priority on. I set a goal of 25 books, but ended up reading a few really quick single-sitting reads that helped me surpass the goal. 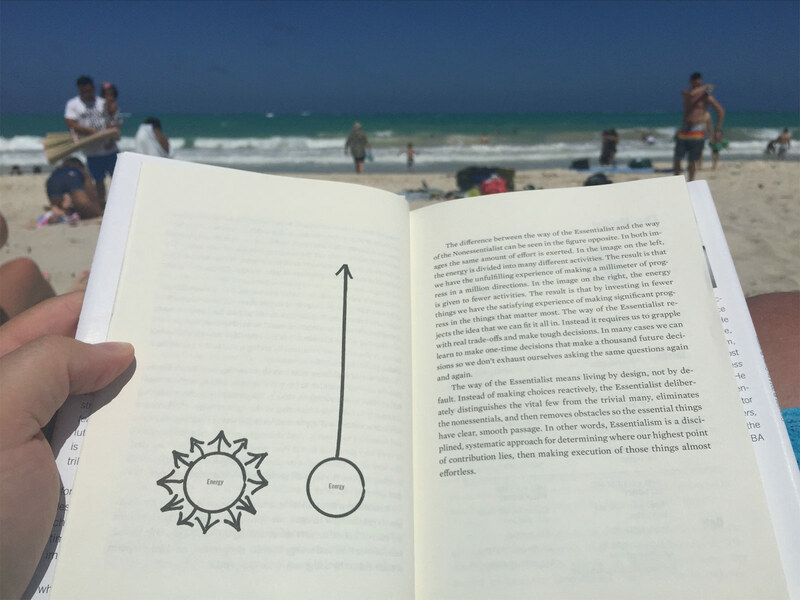 One of my favorite books from last year was Essentialism by Greg McKeown. The main principle is less, but better. I started to employ this in every area of my life; time, meetings, projects, clothing and other material things. I feel as if it’s never complete so it’s always part of the decision making process. We have to continue to ruthlessly prioritize our lives otherwise we end up living a life someone has prioritized for us. Create an environment and place to read. My “place” in Hawai’i was the beach as the waves crashed in. About 3 weeks into starting this new behavior, it became a habit. If I went to the beach after that without a book, it didn’t feel right. For you this could be a coffee shop where you go without your computer and leave your phone in your bag. This could be a little reading nook you create in your house with a chair and bookshelf. Make sure you’re comfortable, it’s well lit and you’re able to focus on reading and thinking there. I continued to embrace my fears and face them head on – mainly the ocean. 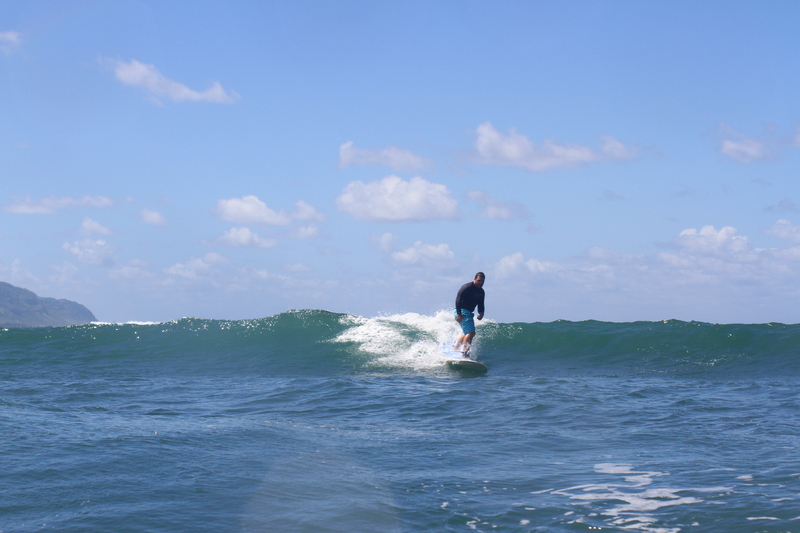 I surfed, snorkeled, body boarded, standup paddled and swam in the ocean at least every other day. In 2004, I started out as more as a graphic and visual designer that really focused on how things looked. I fought for design details in the name of aesthetics instead of user outcomes or feedback. I started doing more UX work in 2013, but in 2015, I really started to focus my new design learnings on UX. I started absorbing and implementing Lean UX, design sprints, behavioral & cognitive psychology, and principles of user-centered design. Focusing on user-centered design means you’re focused on creating more value for your end users. This may also mean more value for the business that’s offering the app, product, or service you’re designing around, but it may not as well. More user value may cost more to the business, but an investment in better experiences will pay dividends for the business through better outcomes. I attended my first two design conferences, UXPA and Epicurrence. 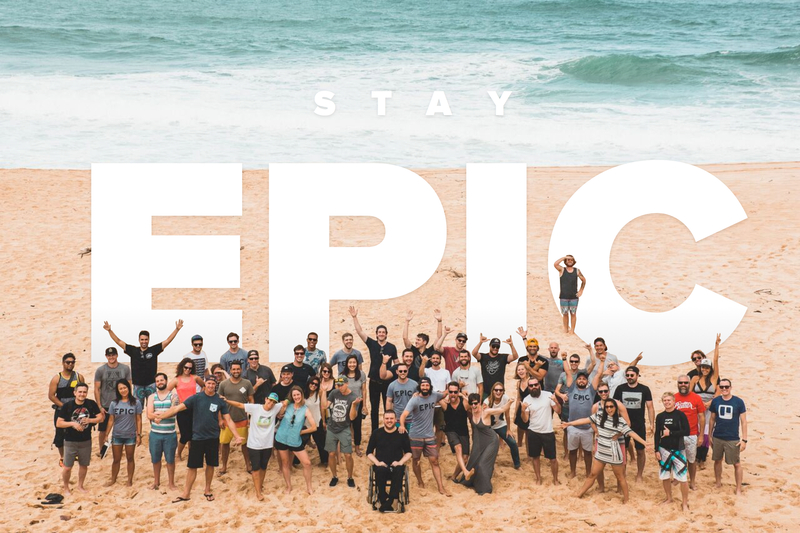 Both were great experiences but I learned more and met so many amazing, passionate, live-loving people at Epicurrence. I wrote an in-depth recap post about Epicurrence No. 2 North Shore, Oahu. I started meditating using Headspace and writing a daily 5-10 minute journal. My awareness of emotions, thoughts, and empathy definitely has increased. If you have never meditated or rarely get time to think, I would recommend using Headspace. Andy at Headspace is a friendly, refreshing meditation guide with subtle british accent delivery. Our mother passed away in July of 2014, so last year was the first year we had both her birthday and also the anniversary of her passing. It was and still is challenging and I think about her almost daily. When we were back in Wisconsin visiting in July we erected her stone and all gathered on the anniversary to celebrate her life and share old stories and memories. It hasn’t gotten any easier, I think you just get stronger and are able to deal with the loss better. Despite being in paradise already, we were blessed to travel and go on 5 trips, some to other islands in Hawai’i, others to celebrate birthdays and independence day. Traveling is so amazing because you’re able to view things from different perspectives and develop deeper empathy for different customs, cultures, and people. I started a new design and development company, Headway, with three amazing and experienced people, Eric Verboncouer (my brother), Chris Schmitz and Jon Kinney. We started some initial consulting in summer and by September 1st, we all took the leap and were full-time Headway. In some regards, it was a big risk, but our team is really talented and we all trusted our abilities. We ended 2015 with adding 2 amazing humans and developers to the crew, Tommy Byrne and Mark Garrigan. 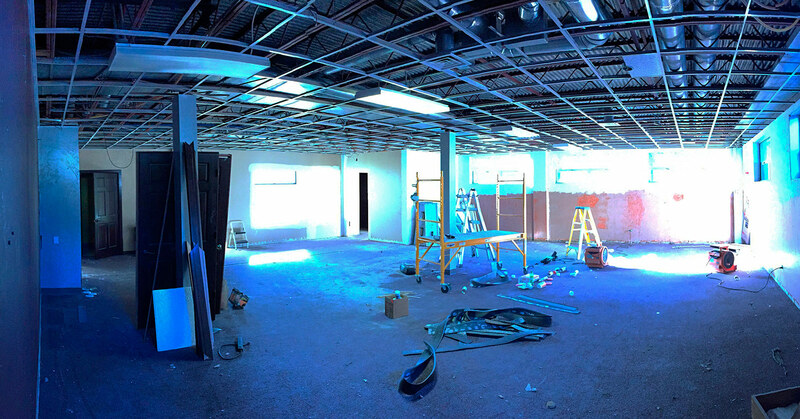 Since then we’ve hired another crew member and are currently finalizing the build out of the new Headway HQ in De Pere, WI. At the end of 2015, we moved back to Green Bay, WI to spend more time with family, friends, and start settling down. It’s been great being back for a few months so far and looking forward to exploring more in our home state. 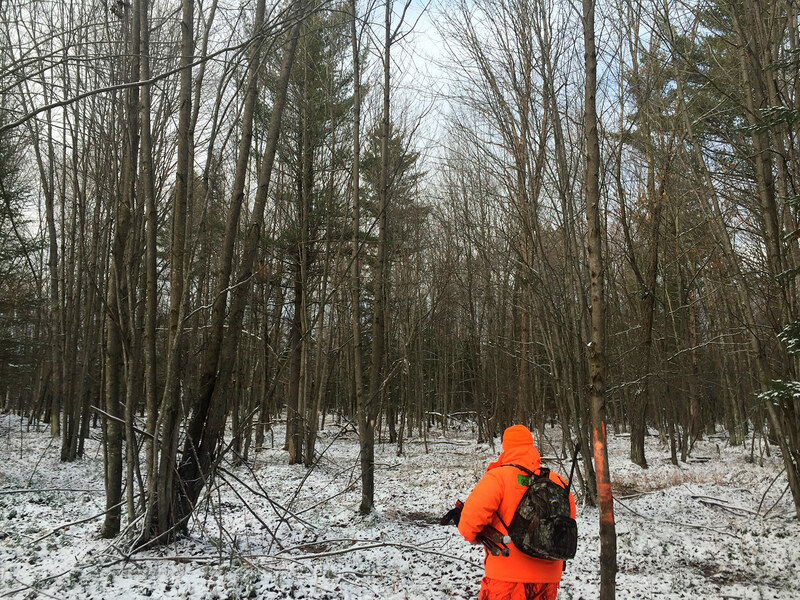 Deer hunting with my brothers in Pound, WI. Packers vs Bears Game on Thanksgiving Day in Green Bay. 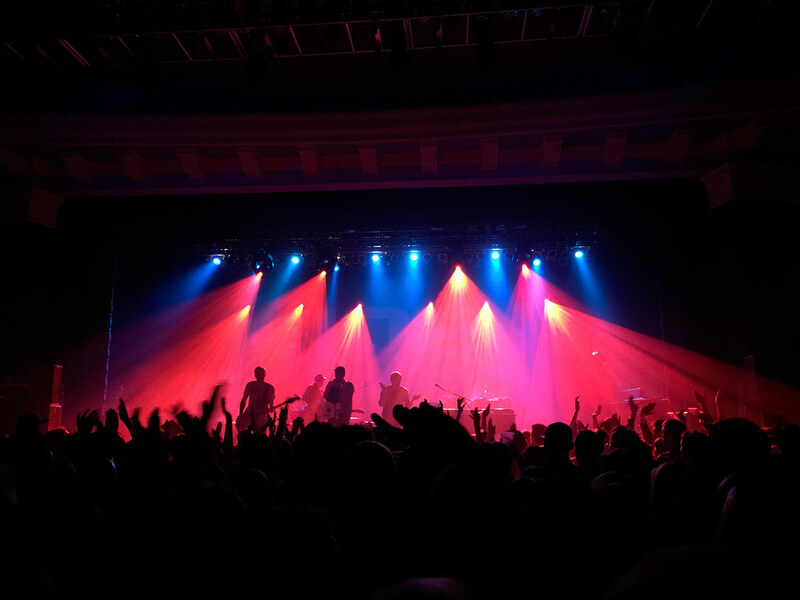 An amazing Of Monsters and Men concert with Lauren in Milwaukee, WI. It’s amazing how things can become routine if you let them and there’s a plethora of beauty and adventure right in your back yard. I encourage you to look for opportunities to put yourself in unfamiliar and uncomfortable situations, because that’s where the growth happens, your character is tested and even sharpened. Cheers to success, growth & adventure in 2016!